The MT98xML series LXI™-certified, two-carriage automated tuners are optimized for a broad class of infixture and on-wafer applications requiring simultaneous high-gamma and multiple-frequency tuning. Based on Maury's proven non-contacting probe technology, these high-performance tuners evolve beyond outdated contacting probe technology to deliver high VSWR with superb accuracy and reliability. 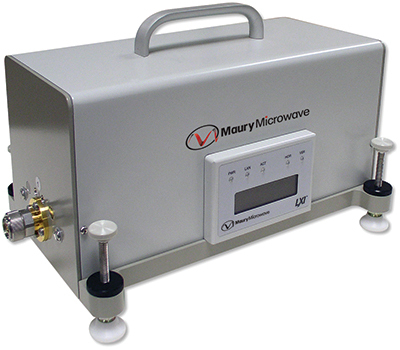 An integral component of Maury Device Characterization Solutions, these PC-based automated tuners are controlled using one of three Maury Software Solutions; Maury's MT930 series IVCAD Advanced Measurement and Modeling Software; Maury's Device Characterization Software suite (ATS version 5 or later); or Maury's DLL environment. With a tuning resolution in excess of a million impedance points over the entire Smith chart, Maury automated tuners give you the device characterization answers you need with the accuracy necessary to make engineering decisions with confidence. Typical applications include load pull using CW and pulsed harmonic load pull for GaAs and GaN characterization, 2G/3G/4G base stations and mobile handsets, wireless connectivity (WiMax, WiBro, WLAN), Sat-Com, and other L/S/C/X/Ku/K-band applications. The MT98xML-series LXI™-certified harmonic tuner is ideal for load pull, harmonic load pull, hybrid active load pull and all automated tuner applications.